Sports drinks are a great way to replenish electrolytes after a tough workout. Making your own version at home makes them even healthier. Last month I found myself drenched in sweat, using all of my mental willpower to push through a 10K race (with a few choice words swirling around my head for the hill-loving course designer). While I usually forgo the hydration stations during races (I’m not much of a drinker during exercise, and never really feel the need to break up my run), this race was different. The temperature steadily climbed into the high 80’s as the race went on, and the inclined course had me dripping with sweat, which was bringing on a headache. Every time I stopped at a station I fell back on my typical habit of avoiding sugary beverages, bypassing the neon-colored liquids filling half the cups in favor of plain old H20. While this choice is typically a smart one (after all, liquids are a huge source of unwanted calories and sugar in the standard American diet), according to Natalie Rizzo, RD, founder of Nutrition à la Natalie, this situation turns out to be an exception to the rule. My rule of thumb is generally after an hour, you want to kick in with a sports drink. 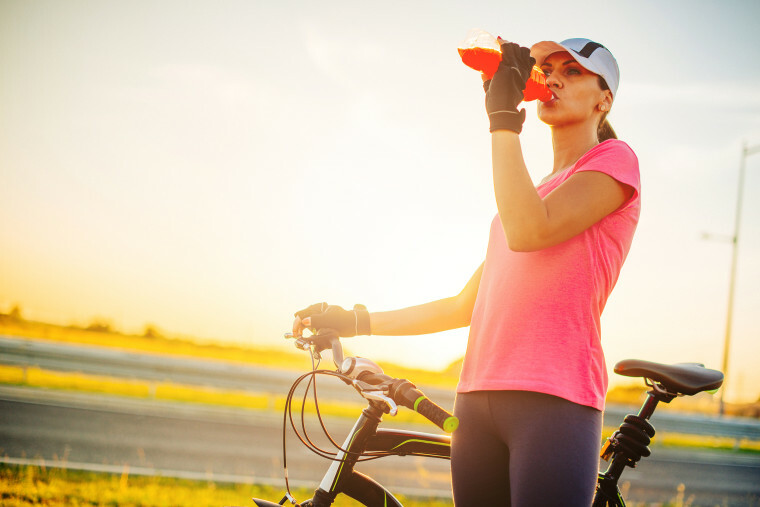 When is a sports drink the right choice? “My rule of thumb is generally after an hour [of activity], you want to kick in with a sports drink,” says Rizzo. But this rule varies based on the conditions and how much you sweat. Feeling dizzy, fatigued, headaches or rapid heartbeat can be signs of dehydration, which means you are probably lacking fluid and electrolytes. There are also some physical symptoms you can be aware of that signal you may need tohydrate with something more than water. “The white residue on skin is a sign of sodium loss. Muscle cramps often mean that you need more potassium. And feeling dizzy, fatigued, headaches or rapid heartbeat can be signs of dehydration, which means you are probably lacking fluid and electrolytes,” says Rizzo. “In terms of things to look out for, I would be wary of any artificial flavors or colors and high fructose corn syrup (HFCS),” says Rizzo. “Gatorade uses sugar and dextrose, while Powerade uses HFCS. Many serious and elite runners use a powder to make their own, and many endorse Skratch Labs because they use a mixture of cane sugar and dextrose as the sugar [source]. Both are more natural sugars that get into your bloodstream quickly. " But an even better option is to make your own. Not only can you control the ingredients, but DIY-ing your own at-home sports drink will also save you money. Ready to whip up your own sports drink? Rizzo has three different recipes. Here, she shares the strawberry version, but you can also make it with orange juice or lemon, based on your taste. “I like to make them in a mason jar so that you can let it sit overnight and if you let the frozen strawberries infuse in there, it tastes really good the next morning, you can make it ahead of time if you have an early morning run or workout and it’s a lot cheaper than buying them at the store,” she says. Combine all ingredients and stir. Infuse overnight for the best taste!